St. Jude Cloud expanded to include 10,000 whole genomes in its first year of availability. In addition, interactive features help scientists quickly analyze date to further their research. St. Jude Cloud was unveiled during the 2018 American Association for Cancer Research conference — and a year later, the world’s largest repository of pediatric genome data is helping to advance scientific research and discovery. With about 10,000 whole genomes, scientists and analysts can get a more comprehensive view of a cell’s DNA. 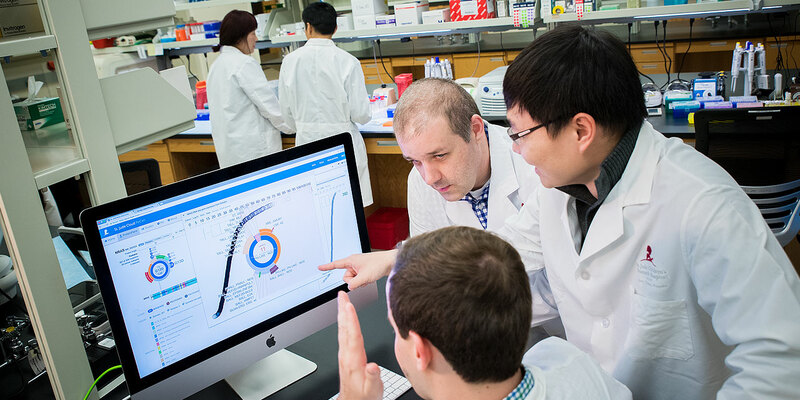 St. Jude Cloud provides next-generation sequencing data, analysis tools and visualizations to help researchers worldwide identify new genetic drivers of childhood cancer and advance cures. The project began in part because Scott Newman, PhD, bioinformatics scientist at St. Jude, became frustrated at the amount of time it took to download data. “Before I came to St. Jude, I worked at another U.S. research institution, and I found something really interesting in one of our high-grade glioma patients. I wanted to see if I could find it in other patients,” he said to Progress Blog last year. “St. Jude, which has shared genomics data for many years, had the biggest and best high-grade glioma dataset out there. In all, it was over 10 terabytes of information, and I had to download it from a server in Europe onto my local computer. That same amount of information now can be done overnight. St. Jude Cloud was named Microsoft Corp.’s 2019 Health Innovation Award recipient for creating a breakthrough solution to empower health and life sciences organizations while meeting global, local and industry-specific compliance and security standards. In the past year, more than 800 people from 400 research institutions have registered with St. Jude Cloud. St. Jude also received the American Association for Cancer Research 2019 Team Science Award in Atlanta during the opening ceremony of the organization’s annual meeting. The hospital is being recognized for research that is transforming the lives of childhood cancer survivors. Registering for the cloud levels the scientific ground for everyone. Whether at a small lab or high-powered institution, scientists want data — they want to do something to it, and then they want to see the results.